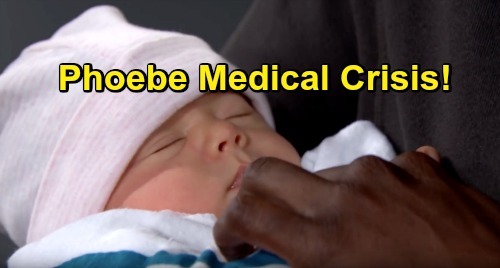 The Bold and the Beautiful Spoilers: Baby Phoebe Shocking Medical Crisis – Liam and Hope’s Life-Saving Donations Needed? The Bold and the Beautiful (B&B) spoilers tease that Steffy Forrester (Jacqueline MacInnes Wood) will get exactly what she wants. She’ll finalize the adoption and have her precious girls under one roof. It won’t take Steffy long to fall in love with little Phoebe Forrester (Rosalind Aune and Isabella de Armas). She already feels like Phoebe was meant to be Kelly Spencer’s (Zoe Pennington and Chloe Teperman) sister. Of course, Steffy doesn’t realize this really is Kelly’s baby sis! Thanks to Dr. Reese Buckingham’s (Wayne Brady) sneaky scheme, Steffy’s adopting Beth Spencer and intends to raise her as her own baby. She thinks she’s doing a good thing for Florence (Katrina Bowden), Kelly and even herself. Steffy believes all the pieces are falling in place to create the perfect family. However, Steffy’s happiness will come at Hope Spencer (Annika Noelle) and Liam Spencer’s (Scott Clifton) expense. They’ll remain in agony over Beth’s “death,” although it’s safe to say Hope will be stuck in grief the longest. She’ll continue to feel deeply connected to Beth, so it’ll be hard for her move on. The good is Hope will be reunited with her child eventually. The bad news is it could take a while – and there are bound to be some terrible moments until then. B&B fans will likely see several close calls when it comes to the truth. After Reese’s gambling addiction is exposed, that could make Dr. Taylor Hayes (Hunter Tylo) stop and think about what else he might be hiding. She may wonder if this adoption was legit. That could be the first step toward putting Taylor on a truthful path. The Bold and the Beautiful viewers can’t forget about that crucial birthmark either. Hope and Liam noticed one on their fake daughter’s leg. That wasn’t the real Beth, but the birthmark should come back into play as a clue eventually. Hope may attend the support group Taylor suggested and run into that child’s true mother. Reese’s plan could be falling apart before he knows it, but what will be the final bombshell? What will finally clue Hope and Liam in? This kind of storyline is the perfect setup for a medical crisis. It’s easy to imagine “Phoebe” having some type illness that requires blood or another donation from her biological parents. Reese is a lot of things, but he doesn’t seem like the kind of guy who would let a baby die to save himself. Would he pipe up about this child’s real parents? Even if he didn’t, there could at least be a scare. It’d be a missed opportunity if B&B didn’t rush “Phoebe” to the hospital at some point. The Bold and the Beautiful spoilers say some exciting twists and turns are ahead. We’ll give you updates as other B&B details emerge. Stay tuned to the CBS soap and don’t forget to check CDL often for the latest Bold and the Beautiful spoilers, updates and news.